Leachate runoff from harvested feed can erode concrete, corrode metal, and negatively impact water resources. The authors are senior research specialist and outreach specialist, respectively, at UW Discovery Farms. It seems pretty rare to find a 2-for-1 deal that is of value. It can also feel frustrating when proposed practices to protect the environment impede your ability to remain efficient and profitable. Proper silage storage strategies offer the rare 2-for-1: What is best for your feed is also best for the environment, and both require implementing the same strategies. During a two-year study on three bunker feed storage facilities, the University of Wisconsin Discovery Farms Program identified enhanced nutrient losses when water came in contact with feed and pad litter. Several practices can be used to minimize losses and maintain feed quality. Discovery Farms’ research found that the average phosphorus and nitrogen losses from feed storage runoff are 120 times more than edge-of-field losses. If the crop is too wet, then it is at risk of breeding unwanted microbes that can reduce palatability and boost livestock health risks while not supporting the bacteria needed for proper fermentation. Too much moisture also means more potential for liquid to ooze out of your pile. That liquid, also known as leachate, is likely to carry with it a high concentration of nitrogen, phosphorus, and other constituents that can have negative impacts downstream. It can be challenging to harvest crops at the recommended moisture content, but it is the first step to ensure feed and water quality. It’s often recommended not to harvest corn silage above 70 percent moisture and hay silage above 65 percent. Check the forecast. If rain is in the forecast during filling and packing, temporarily cover silage to prevent additional water from entering your pile. Additional water added to feed before sealing raises the moisture content, which counteracts harvesting at the recommended moisture. When filling, pay special attention to the back corners. It is important to pack silage so all the water sheds away from the pile. Voids in the back corners of bunker walls are common areas for water to pool, especially after shrinkage caused by the fermentation process. Fill the bunker so the silage pile is slightly above the bunker wall to allow for shrinkage so that pockets don’t form in the back corner. Seal the edges after covering to keep water out. Adequate covering ensures proper fermentation, which is needed to produce high-quality feed. Also, the less water that comes in contact with the nutrient-rich feed, the less nutrients that will run off with water. Cover sidewalls. This will help keep water from running down the edges and seeping into the feed. Be careful when covering sidewalls to allow for shrinkage of the silage pack so air gaps are not formed between the covering and the silage. An alternative option is to cover the sidewalls prior to filling. First, allow 2 to 4 feet of cover at the bottom of the walls, then flip the cover temporarily over the walls, dump silage along walls to hold side cover in place, fill the bunker, and finally flip the side cover back over the top of the silage pile and overlap it with the top cover. Where does the water flow? Make sure water diverts away from the feed storage area. Drainage from areas outside of feed storage should not drain into the feed storage area. The pad should slope away from feed and water should drain off the feed pile to a collection point. If you notice water draining into your feed storage area, divert it away. If it is unavoidable, make sure water stays away from feed and keep the pad clean of litter. Is water backing up into the silage pile? Ensure that the end of the bunkers do not intrude your feed pad’s high water mark. Water that backs up into silage will wick into feed and then seep out, carrying nutrients away when water recedes. In areas where this may be unavoidable, lay covering near the end of the pile, apply silage, and then wrap it up in the covering so that the top cover overlaps it. Are there holes in the cover? Holes in the covering allow water and air to enter. Water can percolate through feed and air can be reintroduced to fermented silage, which will lead to spoilage. Repair any holes or rips in covers immediately. How exposed is the vertical face? Keeping a well-maintained vertical face during feedout minimizes the exposed area. Avoid uncovering more than necessary at any one time. This minimizes exposure to water and aids in achieving a feedout rate that is greater than the spoilage rate caused by exposure to air and moisture. Both the feed quality and water quality benefits from properly harvesting, storing, and protecting feed are substantial. Industry estimates suggest that 20 percent of the corn silage ensiled each year is lost due to improper storage techniques. The economic impact of improper storage is too significant to ignore and so, too, are the water quality risks. 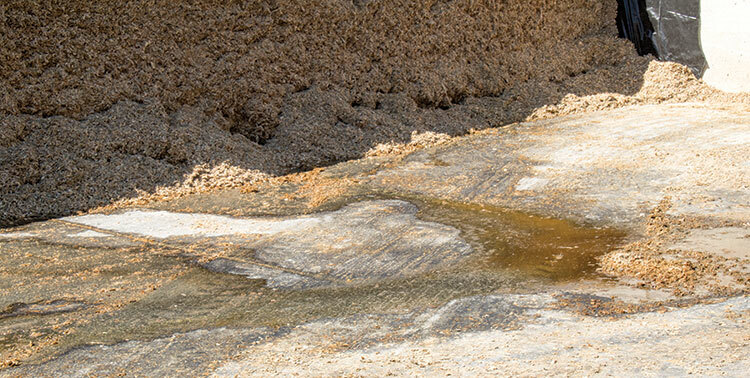 Leachate flowing from feed harvested at too high of a moisture content can erode concrete, corrode metal, make aquatic habitats unlivable, and render drinking water unsafe. In addition, Discovery Farms’ research found that the average phosphorus and nitrogen losses from feed storage runoff are 120 times more than edge-of-field losses. Flow from feed storage results in feed quality decline and causes environmental concerns if corrective steps are not taken. Proper silage storage protects your bottom line and water quality. So, this season make sure to manage for this 2-for-1. For more information on the UW Discovery Farms leachate project, visit UW Discovery Farms on the web at www.uwdiscoveryfarms.org or contact Aaron Wunderlin at aaron.wunderlin@ces.uwex.edu. This article appeared in the February 2017 issue of Hay & Forage Grower on pages 26 and 27.